Because love is a million little things I’m taking a new approach to Valentine’s Day this year. I’m not buying any little gifts or cards. This year I’m going to put my money where my mouth is, to borrow another phrase from the 70’s, and actually give a bit of myself this year. I couldn’t think of a better way to do that but with one of those gifts that keeps on giving – a coupon book. These are really quite easy to make using a basic matchbook format. The hardest part is coming up with the coupons and I’ll help you with that too! You can purchase your matchbooks from a company like Daisy D’s or Basic Grey, but it’s not difficult to make your own. I used a 4 x 12 inch strip for each of my coupon books to keep it really simple. The coupon pages inside are printed on a 5.5 X 3.75 inch page with a half-inch margin on the top, right and bottom and a 1.75-inch margin on the left. A double-sided cardstock makes the best cover. That way you have a nice design or color on the inside when you open it and the heavier cardstock will hold up better to opening and closing. For the 4x12 inch matchbook, mark lightly with pencil on the inside long edges at 1.25 inches, 7 inches and 7 3/16 inches. Next score the cover at these marks and then fold up (toward the inside) on all your score marks. Punch two holes in the bottom (short) flap a half-inch from the top edge and 1 inch from each side. When you’ve printed your coupons you can line them up inside the cover and mark where the holes will need to be punched in the coupons themselves. I used brads to secure my books but if you used a thinner paper rather than cardstock for your coupons you could probably staple them together. I have 12 coupons printed on cardstock in each of my coupon books. If you’re going to make a “lover” coupon book – you’d best prepare yourself for “kid” coupon books too. Here are some kid appropriate coupon books I made for my three little loves. Consider the age of the child when making up the coupons. In my kids books I included very low cost easy to do coupons. You could certainly go great guns here and include theme park or museum tickets, trips to the park, or meals out. When making up your coupons be sure to cover your backside with the fine print! 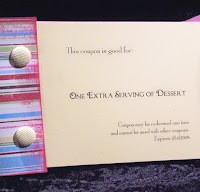 Include an expiration date (generally one year from the issue date), a note about how often the coupon can be redeemed (some only once, and maybe some once a month) and that little line about only using one coupon at a time. 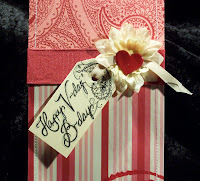 This monochromatic design is for a good friend of mine that has her birthday on Valentine’s Day. It’s always fun to find a way to incorporate the two greetings for her. I particularly like how this pre-made card from Die Cuts With a View opens top to bottom at the upper third edge. Here the shimmer of the new Bazzill Bling cardstock gives this card an extra bit of zing even though the design is fairly simple. The letters and heart are chipboard, which also make it stand out. This simple design utilizes iron on letters that you just might have left over. How many X’s do you have left in that growing collection of yours? And I'll leave out my farewell... which was very sweet and cleaver. 1. Cut a piece of double-sided cardstock 12 x 4 inches. 2. Mark with pencil, score with a stylus or bone folder and fold up at 1 1/4 inches, 7 inches and 7 3/16 inches. 3. On short flap measure in 1 inch from each edge and down 1/2 inch from the top edge and punch small holes for brads to go through. 4. Set word processing program for a 5 1/2 x 3 3/4 page. Set margins at 1/2 inch for top, right and bottom. Set left margin at 1 3/4 inches. 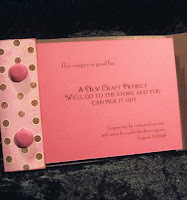 Type coupon text & print on cardstock. 5. 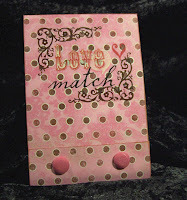 Line pages up – centered inside matchbook and mark for punching holes. Remove from matchbook and punch two holes in the bottom of each page. 6. 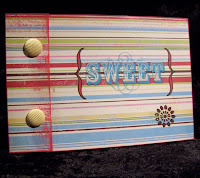 Ink edges of matchbook, decorate with rub-ons, stamps, or chipboard and secure pages in book with brads. Brads should go through short flap on front of matchbook and the coupon pages only. Use adhesive to stick the last coupon to the matchbook back at the brad attachment. 1. Cut patterned papers to cover top and bottom flaps on front of card. Stamp paisley on bottom striped paper then sew around edges of both papers. 2. Run ribbon through Xyron and adhere to bottom edge of top patterned paper. 3. Adhere papers to the front of the card. 4. 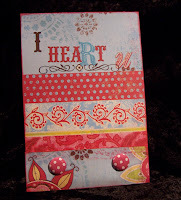 Fit heart shaped brad into flower and adhere to card. 5. 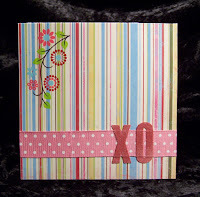 Journal and doodle on tag, tie with ribbon and adhere with glue dots to card top and flower. 1. Cut Bazzill Bling cardstock to 6x12 inches. Score and fold in half to make 6-inch square card. 2. 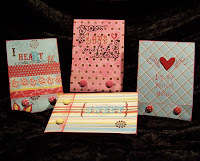 Cut patterned paper to 5 ½ square. Cut right edge with pinking scissors. 3. Sew around edges of patterned paper with machine. Adhere to front of card. 4. 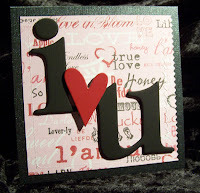 Paint chipboard letters i and u with black paint. Adhere to front of card as shown. Adhere chipboard heart with black foam dimensional tape. 1. Cut double-sided cardstock to 6x12 inches. Score and fold in half to make 6-inch square card. 2. Run ribbon through Xyron and adhere to bottom third of card front. 3. Iron on X and O over ribbon. I love the coupon book idea. I need to make one of these for my kiddos. Alright, alright...for my hubby too. Head 'em up move 'em out - Rolos!